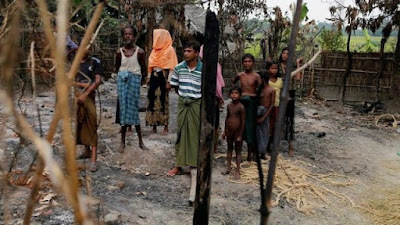 The United States is "deeply troubled" by the findings of a United Nations report that said soldiers in Myanmar's Rakhine State had committed atrocities against minority Muslims, the State Department said on Monday. Washington was still studying the report, but urged the Myanmar government "to take its findings seriously and redouble efforts to protect the local population," a spokeswoman for the department, Katina Adams, said. The allegations should be investigated "in a thorough and credible manner," and those responsible for any violations held accountable, she said, adding that Washington was continuing to call on the government to restore fully humanitarian and media access to the area. The U.N. report issued on Friday said Myanmar's security forces had committed mass killings and gang rapes of Rohingya Muslims and burned their villages since October in a campaign that "very likely" amounted to crimes against humanity and possibly ethnic cleansing.